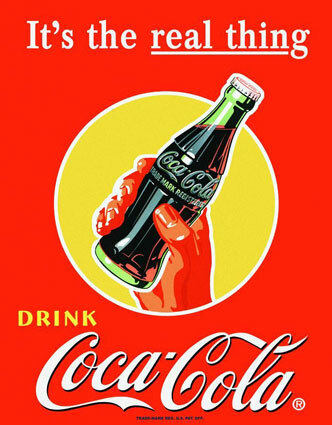 In 1969, the Coca Cola Company came out with one of their most memorable slogans: “Coke. It’s the real thing.” This slogan was meant to distinguish Coca Cola from all those other “phony colas” out there which were not the real thing, but only discount knock-offs. There’s only one real cola and these advertisers wanted us to know that it was Coke. Of course, the great philosopher Plato would disagree with Coke’s slogan. Plato distinguished between two worlds: the material world which he described as a world of incidental, outward forms and the non-material world which he maintained was the world of true and universal Forms. Thus, a physical object like, let’s say, a bottle of Coca Cola, was only an incidental form and shadow of a larger, true, grander Form in a spiritual world of Forms. A physical bottle of Coca Cola, then, would quite literally not be the real thing. No, the real Coca Cola resided somewhere in an inaccessible spiritual world of true Forms. Plato’s distinction between the true spiritual world of Forms and the illusionary physical world of forms has profoundly influenced nearly every philosophical system. It especially held sway over the philosophical systems of the first century. The Epicureans believed, for instance, that since everything in this physical world was only a shadow of the true spiritual world of Forms, everyone was free to live how they wanted, doing with their bodies as they wanted. After all, our physical, bodily forms did not really matter. It was our spiritual Forms that really counted. Enter the Corinthian Christians. This congregation had apparently bought into Platonic and Epicurean philosophies and found it acceptable and even admirable to live hedonistic lives, apart from any ethical scruples. Indeed, they had a slogan to summarize their philosophical sensibilities: “All things are lawful for me” (1 Corinthians 6:12). The Corinthians believed that whatever they wanted, desired, or thought they needed, they could obtain without regard to moral law. Were they hungry? They could gorge themselves. Were they lusty? They could engage in promiscuity without so much as a second thought. After all, this physical world is only a place full of shadows and our physical bodies are only shells. The real spiritual Form of us resides somewhere else. The apostle Paul, when addressing the Corinthians, has a somewhat different estimation of this physical world and our physical bodies. He writes, “The body is meant…for the Lord, and the Lord for the body” (1 Corinthians 6:13). Paul’s argument is simply this: what you do with your body counts. Your body is not just a shifting shadow of a greater spiritual reality in some non-descript world of Forms. Indeed, the body is so precious that the Lord is “for the body.” In other words, God thinks your body is a good thing! Tall, short, fat, skinny, black, white, Hispanic, male, female, old, young, or middle aged, God is for your body! He cares about your body! Indeed, he cares about it so much that he promises to raise it imperishably from the dead on the Last Day (cf. 1 Corinthians 15:42). This final line is probably a liturgical gloss. In other words, whenever a letter like Paul’s would be read out loud to an ancient Christian congregation, the congregation would know the letter so well that they would respond at certain strategic points in the reading. And so, much like when a pastor today says, “The peace of the Lord be with you all,” the congregation will respond, “And also with you,” when the pastor of one of these ancient congregations would read, “So glorify God in your body,” the congregation would respond, “And in your spirit, which is God’s.” These words seem to have become so commonplace, that they made it into some copies of the actual biblical text! Although these words were almost certainly not in Paul’s original letter to the Corinthians, they do provide us with some interesting insight into how Christians viewed their bodies. The body, it seems, was so important to the early Christians that they came up with a responsive liturgy just to extol the value of our bodies along with our spirits: “Glorify God in your body. And in your spirit, which is God’s.” Thus, whether in our physical bodies or in our incorporeal spirits, we are to glorify God with everything in us. What you do with your body matters. It is not just a reflection of some spiritual reality, it is spiritual reality because in your body resides your spirit. So, in both your body and your spirit, live well and so glorify God with everything in you. message or Dr. Player’s ABC! Entry filed under: ABC Extra. Tags: 1 Corinthians 6:12-20, Coca Cola, Epicurianism, Physical, Plato, Spiritual, Textual Variants.